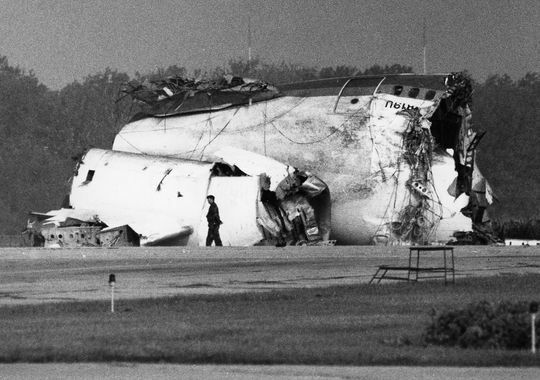 On July 19, 1989 United Airlines Flight 232 crash landed at Sioux City Airport (SUX), Iowa. The incident is one of the most widely recognised crashes in the world. Dubbed the ‘un-flyable plane’, the scenario has been recreated in flight simulators across the globe. No crew has ever made it safely to the ground. 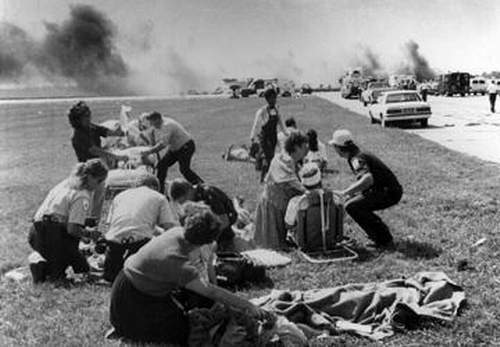 Yet that sunny afternoon, the flight crew managed to get the crippled jet to an airport and miraculously, 185 people survived the horrendous crash. Onboard Flight 232 was flight attendant Jan Brown. Jan has been a heroine of mine and a complete inspiration following an interview I saw with her for a TV documentary called ‘Black Box’. So you can imagine my excitement when I received an email from the lady herself, telling me she had read my ‘Angels Of The Sky’ story and would like to speak to me. She went on to relay information about her bravery and heroism that terrible day and also her tireless, and unfortunately unsuccessful campaigning since the crash to get the Federal Aviation Administration to end the practice of allowing children under the age of two to travel unsecured on a parent’s lap without a ticketed seat. Earlier that day at Stapleton International Airport, Denver the United McDonnell Douglas DC-10-10 sat on the blistering tarmac awaiting its passengers for the flight to Philadelphia Via Chicago O’Hare. Onboard eight cabin crew members prepared the cabin, led by veteran Chief Flight Attendant Jan Brown. In the flight deck, Captain Al Haynes, First Officer William Records and Flight Engineer Dudley Dvorak went through their various pre-departure checklists. Waiting to board were 285 passengers, including 52 children, whose families were taking advantage of United’s ‘Children’s Day’ where tickets only cost a penny. Also travelling that afternoon was an off duty United DC-10 training captain, Denny Fitch who was taking a ride home to see his family. Little did he know that in a few hours, his skills in the cockpit would save the lives of so many. 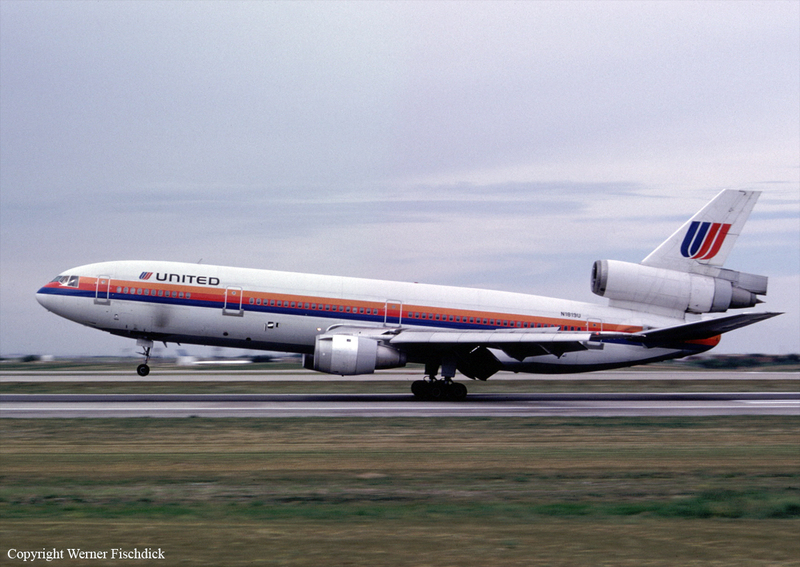 United Airlines DC-10-10, N1819U. The aircraft involved in the accident. The aircraft took off at 14:09 (CDT) and the crew quickly got to work setting up the service for the little over two-hour flight to Chicago. All was running smoothly as the wide-body jet cruised at 37,000 feet. Suddenly at 15:16 a loud bang was heard towards the rear and the whole aircraft shook violently. Passengers and crew immediately thought a bomb had exploded and braced themselves for the worst. In the flight deck, the pilots were bombarded with warning alarms and lights. The auto-pilot disengaged and they noticed that the number 2, tail mounted engine was malfunctioning. First Officer Records took control, while Haynes and Dvorak began to shut down the damaged engine. While running through their procedures they realised the aircraft was veering to the left. Records attempted to bring the plane back to level flight. But no matter how hard he turned the control column the lumbering DC-10 would not respond. As Dvorak checked his engineering panel the shocking truth dawned on them. The explosion had severed all three hydraulic lines which met in the tail and hydraulic fluid was leaking into the atmosphere, the aircraft was literally bleeding to death. Now dangerously close to becoming inverted, Haynes and Records held the control column hard over to the left, but still there was no response. The decision was made to use the two wing mounted engines to level the plane, increasing power to the left and decreasing on the right. They called United’s maintenance facility, but as a total loss of hydraulics was deemed ‘virtually impossible’, there were no procedures or guidelines in place. They were on their own. In the cabin Jan and the rest of her crew were still blissfully unaware of the unfolding drama. She explained “Shortly before the 232 crash, my girlfriend and I were discussing what we would do in a situation such as United 811, where the cargo door had ripped off and taken out a section of business class passengers and seats and only the flight attendants in that area knew what had occurred. My friend said she would go to her jump-seat, buckle up and hang on. That is exactly what I did immediately after our engine exploded as we did not know what had happened, but if it was a decompression, I did not want to be sucked out”. After a few moments she realised the aircraft had not suffered a decompression and began to make her way to the front of the aircraft, calming and reassuring passengers, while the other crew began to stow away the galley equipment and trolleys. When she arrived in the flight deck she could sense something was seriously wrong. Captain Haynes informed her that they had lost the number 2 engine and all hydraulic fluid, rendering the aircraft virtually un-flyable. He told her that they would be diverting to Sioux City Aiport (SUX) and to prepare for an emergency landing. An image of N1819U taken shortly before impact. Even though the image is poor quality damage can clearly be seen to the tail and right horizontal stabilizer. As Jan returned to the cabin to brief her crew, she passed off-duty Captain Denny Fitch who sensed the seriousness of the situation just by the look on her face. Fitch got the attention of another flight attendant Jan Murray, offering his services before being taken to the flight deck. As the DC-10 was now only flyable using the two wing mounted engines, he took control of the throttles, allowing Haynes and Records to continue to try the control yoke. Jan and her crew had forty minutes to prepare the cabin. Passengers sat in emergency exit rows were briefed on how to open and operate the doors, exits were pointed out and all passengers were made to adopt the brace position. She later spoke of the ‘pin drop silence’ throughout the cabin and her dry mouth, as she and the other flight attendants secured galley equipment and ran through their emergency drills. Finally, they prepared the four passengers travelling with ‘lap children’ infants under the age of two. In America, no infant seat-belts are provided for children who are not in an approved child safety seat as it isn’t an Federal Aviation Administration (FAA) regulation. In training, crew were taught to tell the parents to place the child on the floor at their feet and provide the passenger with blankets and pillows, in an attempt to buffer the impact. Jan went on to say that “Something that seemed so plausible in emergency training class seemed ludicrous in a real life crisis”. Now only able to make right hand turns, the DC-10 continued its steady descent towards SUX, but was approaching dangerously fast. In an attempt to slow the aircraft, it’s landing gear was lowered, using gravity to pull down the wheels and lock them in to place. They were now just minutes away from touchdown. The shorter of SUX’s two runways (22) was in sight, the cabin was prepared and secure and they were confident they would make it to the airport. But as they crossed the threshold the aircrafts nose dropped and it began to veer to the right. There was no time for the crew to react. The massive DC-10’s right wing hit the runway and the fuselage slammed into the ground, spilling fuel which ignited immediately. The tail section broke off and the rest of the planes body bounced several times down the runway shearing off the engines and landing gear, before rolling over and sliding to halt in the cornfield to the right of the runway. The whole horrendous impact was caught on camera by news crews who had heard of unfolding emergency. Thankfully, as the aircraft made it to the airport emergency services were on the scene immediately but because of the severe nature of the crash, many thought there would be no survivors. However, as they approached the wreckage they were stunned to see people emerging from the cornfield. One rescuer spoke of how he thought a school party had been on the airfield when the plane had crashed. But this was no school party. Miraculously, 125 of the 296 people onboard suffered only minor injuries and 13 actually walked away unharmed. 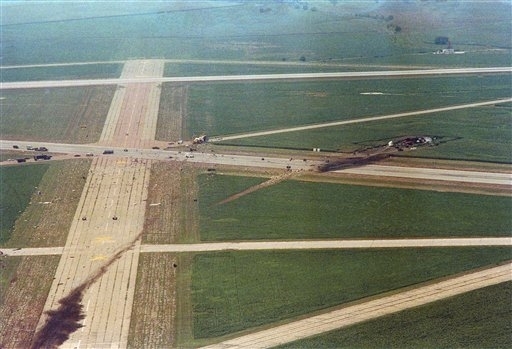 An aerial view of the crash site, showing the path the aircraft took as hit smashed into the ground. A total of 111 people, including one cabin crew member, died in the disaster. Some were killed instantly from the severity of the initial impact. Many died due to smoke inhalation from the subsequent fire that engulfed the aircraft. In the flight deck Haynes, Records, Dvorak and Fitch had also survived the crash. But rescuers initially ignored the cockpit, as it was completely unrecognisable. Thirty-five minutes later the emergency services discovered the debris and the four pilots, severely injured but alive. After many months recovery, all four returned to flying for United. Brown passed out after the “Unbelievable smash to earth”. She explained “I knew there was nothing I could do at that point and when we rolled over, I went in to a deep unconsciousness that I believe saved my life, as this is when the flash fire engulfed me. The cotton and wool uniform protected me except that my nylons melted to my ankles causing second and third degree burns. I had switched to pants only a few years before as I felt they were safer for our job. Talk about good guardian angels!”. When she finally came to, Jan was hanging upside down in what little was left of the aircraft cabin. Ignoring the pain and fear, she began assisting the remaining passengers to escape through the broken fuselage, including an elderly couple who she firmly but gently hurried along so others could evacuate. Thick black smoke was now engulfing the cabin. There was nothing more she could do and left the burning plane to help those who had already escaped. Rescue workers tend to the injured after the crash. The first passenger she came across was the mother of a 22 month old boy, Sylvia Tsao. Jan had initially comforted her shortly after the engine had exploded. Tsao was headed back towards the smoking wreckage to try to find her son, Jan stopped her telling her it was too dangerous. She tried to reassure the mother that the rescue workers would find him, but she was inconsolable and yelled “You told me to put my son on the floor, I did, and he’s gone”. Jan spoke of how up until this point she was feeling no physical pain, clearly in a state of shock. But this emotional encounter jolted her back to reality as she responded, “That was the best thing to do, that was all we had”. As the aircraft hit the ground it broke into three pieces, including the massive tail section seen here. But Sylvia never found her son, Evan Tsao. As the plane smashed into the ground she lost grip and he was thrown around the cabin like a rag doll. He later died of smoke inhalation and was found towards the rear of the aircraft. Jan had suffered various burns and counted herself lucky to be among the survivors. She too returned to flying some months later, but was haunted by Sylvia Tsao’s words. “I guess it wasn’t my time. I still had things to do” Brown said back in 1999. “I guess someone had to be Evan’s voice”. And that was exactly what she did. After the crash, Jan began lobbying congress and the FAA to introduce child safety seats on board planes across the USA. She gathered signatures from fellow flight attendants and appeared on national news programmes. Along with her union The Flight Attendants Association, they managed to gain full support from the National Transportation Safety Board (NTSB), the Aviation Consumer Action Project, the Air Transport Assn. and the Airline Pilots Assn. 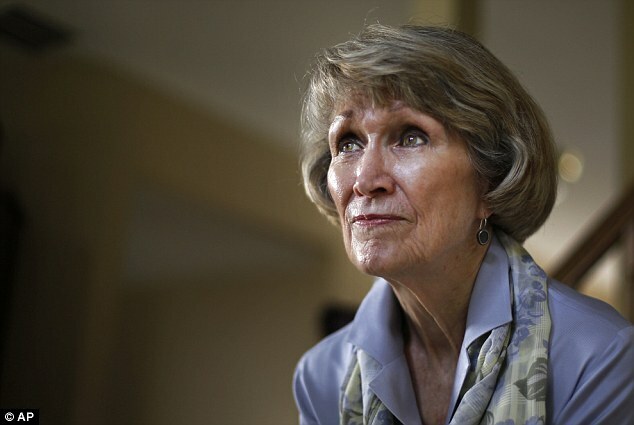 For years, she tirelessly crusaded to prevent the loss of another innocent child’s life. In July 1998, Jan Brown hung up her wings and retired as a flight attendant, but her campaign continued. Unfortunately, despite her best efforts and massive support, to this day, airlines in the United States are still not required to provide infants under the age of two travelling as ‘lap children’ with any forms of restraint. As a UK cabin crew member I take it for granted that we carry infant extension seat-belts to provide to any passenger travelling with an infant. Jan went on to say “That July 19, when not being allowed to go home by the NTSB until they had interviewed us, I paced the floor thinking of what I did or should have done. I finally stopped and asked myself what I could change…..nothing. We cannot control life or death, we can only do our best and own that we do our best, the rest, for me, is in God’s hands”. As for Evan Tsao, “I will grieve for him forever. He inspires me!”. That fateful day Jan and her fellow cabin crew followed their training to ensure passengers safety. Her calmness and professionalism went towards saving 183 passengers and crew, many of whom walked away without a scratch. Her actions that day and subsequent lobbying for changes to legislations, is why Jan Brown joins our Angels Of The Sky. I would also like to give a special mention to Captain Denny Fitch, who unfortunately passed away on May 7, 2012 at his home at St. Charles Illinois after battling brain cancer. 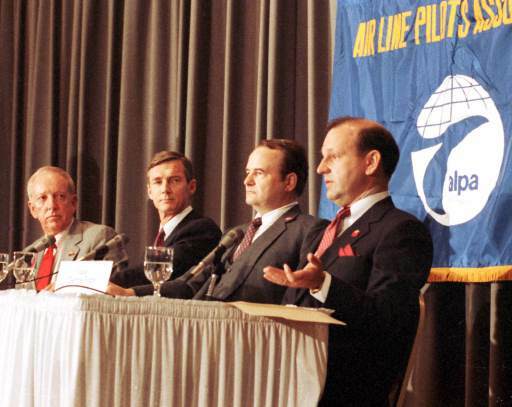 His skill, bravery and professionalism helped the other three members of the flight crew get the aircraft to Sioux City and save countless lives. Chief Flight Attendant Jan Brown and Captain Denny Fitch, who both returned to flying after the crash. how can I contact jan brown lohr! I am a cabin crew my self! I’m not sure how to contact her I’m afraid. I recently met Jan. I see her weekly. I can provide her with your information if you like. After speaking to her about this experience, I began searching the internet about this crash. Amazing! Hi Jacqueline. I would love to speak to Jan if possible. Would it be possible if you or her could email me? confessionsofatrolleydolly@hotmail.co.uk. Thank you. Please provide her with my info. It’s crazy to think that in these days something as simple as a seatbelt is still not a requirement when they have been proven again and again to save lives. But this crew did an amazing job of staying calm under immense pressure and doing the best job they knew how to do. Bad idea reading this the day before I fly!! Yes ALL the crew were heroes. And now United and American have changed their nonrev rules for retirees so they go after every active employee. It makes me sick. God bless them all! Double seatbelts are MORE dangerous for lap babyies than having them loose in the adult’s lap. I wrote the CAA and asked them why they used these dangerous devices that essentially turn babies into air bags. In forward impact, the adult’s torso would come down and crush the child. The CAA responded that it was safer for OTHER passengers to keep the baby from flying through the cabin and injuring someone else. So please don’t imply, as in this article, that a double seat belt would have helped. Lap babies at least have a chance of surviving if loose in the adult’s lap. Attached, they can be crushed. The only way to fly safely with a baby is to have them in a car seat. It’s awful in the U.K. Where rear-facing seats aren’t allowed and parents’ rights to use their own airline-approved car seats aren’t guaranteed. At least U.S. Parents can buy a seat for their baby and use a car seat onboard. British carriers actually force under 6 months to be lap babies (and are instructed to use those dangerous “belly belts”) and firced to use the less safe forward facing position for car seats. Where is the safety logic in that?? Everyone in my little town of SeaTac, Wa know all the Haynes family. All very nice people. One of Al’s sons has died as has his Al’s wife. His daughter had cancer and needed bone marrow that was costing more than they could afford. The survivors, when they found out, raised the money in just days. The daughter is alive and well. Thanks for the information Kathleen. Lovely to hear. Very sad about Al, his wife and one of his sons. One of the fatalities was a United senior flight attendant off duty, just hitching flight back to his home base in Philadelphia. He and hîs partner were customers, two of the nicest people you’d ever get to know. One day his partner showed up without him. So I asked where he was. Thats when his partner said he died at Souix City. He was a tall slim dark haired guy about 27-35(?) of Portuguese descent. It’s still heartbreaking to recall so many years later.